ROUSSELOT, BENJAMIN-VICTOR, Roman Catholic priest and Sulpician; b. 17 Jan. 1823 at Cholet, France, son of Jean Rousselot and Marie Allion; d. 31 Aug. 1889 in Montreal, Que. Benjamin-Victor Rousselot was the sixth child of a bourgeois family that engaged in manufacturing and banking. After classical studies at Angers and a year of philosophy with the Sulpicians in Nantes, he entered the Séminaire de Saint-Sulpice in Paris, at the same time as Ernest Renan who was beginning his theological studies. The seminary provided a solid grounding in both biblical exegesis and theology; open to the influence of the German Catholic school, it sought to integrate theology with day to day living and to develop the historical sense which the scholastic tradition lacked. The ultramontane thinking of Arthur Le Hir had a considerable influence on Rousselot. Unfortunately, he was unable to concentrate fully on his studies because of delicate health and failing eyesight. These handicaps meant that he had to look beyond the seminary at the time of his ordination on 19 Dec. 1846; as a result, he went to work as an assistant priest with the youth of his native village for a six-year period. In October 1853 he was finally admitted to the solitude, the Sulpician noviciate at Issy-les-Moulineaux, dept of Hauts-de-Seine, which was under the direction of Étienne-Michel Faillon*. 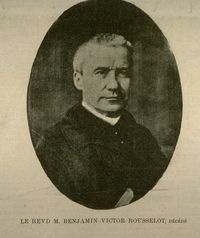 Observing Rousselot’s physical inability to undertake the intellectual tasks of the Society of Saint-Sulpice, Faillon guided him towards the pastoral ministry of the Montreal house, accompanying him there when he himself made a second trip to Canada in 1854. From the time of his arrival Rousselot began to familiarize himself with the two fields in which he would labour in Montreal: the parish of Notre-Dame, which was in debt and overwhelmed by the responsibility of serving the whole city through a network of churches to which the parish denied legal authority; and the chaplaincy to the Sisters of Charity of the Hôpital Général of Montreal (Grey Nuns), in whose good works he was to share. In fact, after two years as confessor to the nuns, he began to develop plans for a crèche for children between two and seven years of age who were in disadvantaged circumstances. The Rousselot family in France protested, fearing that his inheritance would be consumed by the expenditures he was preparing to make. Nevertheless, on 26 July 1858 construction of the building for the Asile Saint-Joseph got under way on a Rue Saint-Bonaventure site donated by the Grey Nuns. By June 1859, when Bishop Ignace Bourget presided at the service to mark the opening of the Asile Saint-Joseph, Rousselot had enlisted financial support for it through private and public solicitation. This first shelter, which had been conceived on a French model, proved an immediate success, and Rousselot persuaded the Grey Nuns to undertake a second project. On 6 May 1860 work began on a Rue Sainte-Catherine site in Montreal which he had purchased with the intent of building the Asile Nazareth; it was finished in December 1861. The success of this nursery for “the class [that was] not in easy circumstances” was ensured by contributions from parents and benefactors, as well as by a monthly supplement of 25 cents per boarder provided from 1870 by the Legislative Assembly of the province of Quebec. From its inception the establishment received a certain number of blind children. In the spring of 1870 Rousselot created a specialized institution for blind children, connected to the building of the Asile Nazareth. This new endeavour, which had been inspired by innovative developments in this field in Paris, was an instant success because of the adoption of Louis Braille’s system; in 1871 people were astonished to observe that the new pupils could already read, write, and perform musical pieces just like other children. In addition to this institution, which later became the Institut pour les Aveugles, Rousselot helped set up the Notre-Dame Hospital in Montreal in 1880, assisting Dr Emmanuel-Persillier Lachapelle* to rent the premises and furnish it appropriately by contributing personally and by standing surety. On 7 April 1866 Rousselot had left his inconspicuous post as chaplain to take the highly controversial charge of parish priest of Notre-Dame in Montreal. 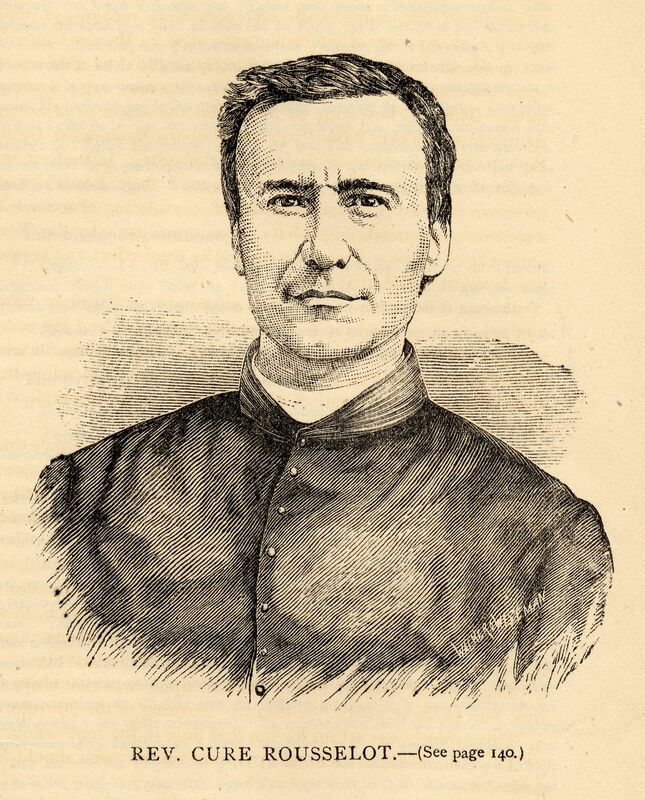 A decree issued by the Sacred Congregation of Propaganda on 22 Dec. 1865 had set out the compromise agreed to by the Sulpicians and by Bishop Bourget which would open the way to the division of the single parish of Montreal [see Ignace Bourget; Joseph Desautels]. The decree in fact inaugurated ten years of crisis and quarrels among the Montreal clergy. 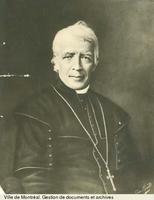 The first nine months of Rousselot’s service as parish priest gave rise to a canonical dispute between the superior of the Séminaire de Saint-Sulpice, Joseph-Alexandre Baile, and the bishop of Montreal. The bishop sought to have Baile put the decree into effect by presenting him with a plan of division which excluded Baile from chairing the parish council; Baile, alleging that certain difficulties had become insurmountable, refused to budge and stirred up public support for the Sulpicians. Caught in this power struggle, Rousselot began work on a project to restore and finish the interior of the church, completed in 1874. Rousselot’s anti-liberalism and anti-gallicanism did not, however, prevent a resurgence of hostility between the bishop and representatives of the parish of Notre-Dame; indeed, the conflict over the division of the parish reached new heights in 1871, with Bourget proposing to obtain civil incorporation of the churches of Notre-Dame parish. In June 1872 Rousselot was obliged to go to Europe, leaving his post for the summer, because he was wretchedly overtired and plagued by violent headaches. In his absence Pius IX issued a decree, dated 30 July, officially recognizing Bourget’s claims. When the statute on the parishes came into force on 23 Feb. 1875, Rousselot found that the territory for which he was responsible had suddenly shrunk with no alleviation of the burden of debt being shouldered by the parish council. He devoted his remaining years at Notre-Dame to new work improving the interior of the church, until on 2 Oct. 1882 he was appointed parish priest of Saint-Jacques in Montreal. Rousselot took no further part in public issues, except for intervening in favour of the textbooks used by the Brothers of the Christian Schools (traditional protégés of the Sulpicians) during the quarrel in 1880 over the bill to secure uniformity in school texts. The wisdom he showed at the time of the Louis Riel affair was typical of the man: in the course of a service at Saint-Jacques in November 1885, he expressed a wish to see it divested of political overtones. He seems to have concentrated on his welfare activities; in a will made in May 1886 he bequeathed his entire estate to the Asile Nazareth, before he left for several months in France to take a cure necessitated by a spinal cord infection. Returning to his pastoral duties, he undertook that year to enlarge Saint-Jacques. He died on 31 Aug. 1889 of the illness with which he had been stricken three years earlier. His contemporaries especially remembered this modest parish priest’s considerable efforts on behalf of the poor and the underprivileged. A French Sulpician, of bourgeois family, who had come to settle in Montreal, he had indeed made his most original contribution to its life by his social and educational innovations. ACAM, 355.101; 588.201; 901.141; RLB, 15; 18. Arch. de la Compagnie de Saint-Sulpice (Paris), Dossier 121, no.31. Arch. départementales, Maine-et-Loire (Angers, France), État civil, Cholet, 17 janv. 1823. Arch. des Sœurs grises (Montréal), Ancien journal, I: 119–20; Dossier, Hospice Saint-Joseph, Chronique, I; Historique; Dossier, Nazareth, le fondateur, Testament de M. Rousselot, p.s.s. ; Rousselot, Saint-Sulpice; “Salles d’asile tenues par les Sœurs de la charité de Montréal, dites vulgairement Sœurs grises dans la ville et le diocèse de Montréal” (Montréal, 1870). ASSM, 21, Lettres de B.-V. Rousselot; 49, Dossier 56. Ernest Renan, Souvenirs d’enfance et de jeunesse (Paris, 1883). La Minerve, 17, 21 mai 1866; 3 sept. 1889. Allaire, Dictionnaire, I: 482. Henri Gauthier, Sulpitiana ([2e éd. ], Montréal, 1926). E.-P. Benoît, Histoire de l’hôpital Notre-Dame, 1800–1923 (Montréal, 1923). Henri Gauthier, La Compagnie de Saint-Sulpice au Canada (Montréal, 1912). 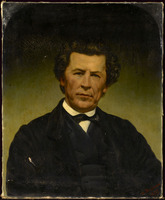 André Labarrère-Paulé, Les instituteurs laïques au Canada français, 1836–1900 (Québec, 1965), 340. Olivier Maurault, La paroisse: histoire de l’église Notre-Dame de Montréal (2e éd., Montréal, 1957), 64–79. Estelle Mitchell, Mère Jane Slocombe, neuvième supérieure générale des Sœurs grises de Montréal, 1819–1872 (Montréal et Paris, 1964). Léon Pouliot, “Il y a cent ans: le démembrement de la paroisse Notre-Dame,” RHAF, 19 (1965–66): 350–83. Louis Rousseau, “ROUSSELOT, BENJAMIN-VICTOR,” in Dictionary of Canadian Biography, vol. 11, University of Toronto/Université Laval, 2003–, accessed April 21, 2019, http://www.biographi.ca/en/bio/rousselot_benjamin_victor_11E.html.